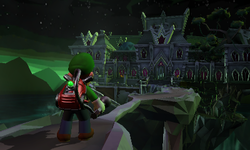 Treacherous Mansion is the final and longest mansion that Luigi visits in Luigi's Mansion: Dark Moon. It has a museum theme. It is also the location of the final Dark Moon piece. Many rooms on the first floor of Treacherous Mansion are based off of the previous mansions in the game. Almost every ghost that Luigi encounters appears here. 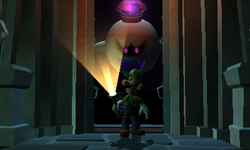 King Boo comes to this mansion to open a paranormal portal to unleash almost every ghost that Luigi has ever encountered, such as Greenies, Slammers, a Gobber, Sneakers, Mummies, Hiders, and Creepers, and most of these ghosts are either shielded, strong, or equipped with a weapon of some form. This multitude of ghosts will bring about the destruction of Evershade Valley. There are also gargoyles inside and outside of the mansion. Treacherous Mansion is the only mansion in the game that requires Luigi to open just one door; the rest of the doors are already unlocked. It is also the only mansion besides Gloomy Manor that has multiple music tracks; the track changes whenever Luigi looks through a window or crack in the wall. 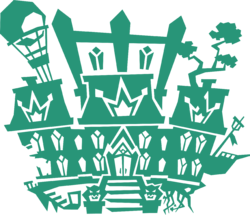 It is also the only mansion to have two missions primarily dealing with ghost-capturing: Paranormal Chaos and Terrifying Invasion. Finally, it is the only mansion whose respective Dark Moon piece and possessor ghost are not found in the mansion's vicinity. The bottom four exhibits in the mansion are based on the four previous mansions in the game in some way. The Dark Ages Exhibit represents Gloomy Manor due to the knights found in the manor, the Jungle Exhibit represents Haunted Towers due to both having botanical designs, the Ancient Exhibit represents Old Clockworks due to the latter having an Ancient Egyptian-like basement, and the Ice Age Exhibit represents Secret Mine for their icy themes. Treacherous Mansion is an abandoned Museum positioned right in the middle of a giant ravine, which becomes cut off from land access after Luigi reaches the front steps. 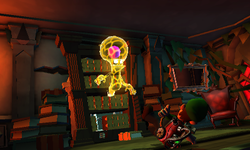 According to E. Gadd, the mansion contains artifacts and items from Evershade Valley and beyond making it the most "precious" of the mansions. The Mansion is slightly changed to a more spooky feel after King Boo arrives. It is called the Treacherous Mansion as it could collapse into the ravine below. It however does not at any point. This massive mansion is filled with exotic exhibits created by its late globe-trotting owner. Oh, and it also contains the strongest paranormal signals ever recorded! E-1 Front-Door Key The paranormal activity in this mansion is completely off the charts! Stay on your toes, and start looking for the Dark Moon piece. E-2 Double Trouble I assigned a Toad assistant to take care of the valuable exhibits in the Treacherous Mansion. Let's find him. He might know a thing or two about the Dark Moon piece. E-3 A Train to Catch The Toad curators brought a security-camera image back with them. Maybe it'll give us some clues about the next Dark Moon piece. 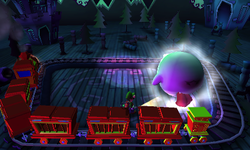 Luigi, King Boo is in the Train Exhibit! Let's strike now, while we have the element of surprise! Get in there, defeat King Boo, and rescue Mario! E-5 Paranormal Chaos I'm getting strange paranormal readings on the Terrace. We'd better send you in to inspect the place. Stop the Knightmare The portal on the Terrace is still open, but we've got to hurry. Button up those overalls, my boy! It's time to battle King Boo! Terrifying Invasion We have an EMERGENCY! The Parascope is detecting whopping paranormal signals in the mansion! 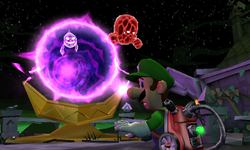 Luigi...THE END IS NEAR! Treacherous Mansion Music - The song that plays in Treacherous Mansion. Terrifying Invasion Music - The song that plays during Terrifying Invasion. This is the only mansion where Luigi has to rescue two Toads in one mission. 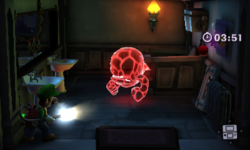 While Luigi is under the mansion in the Dungeon Cells, Professor E. Gadd will call him, but with no interference with the DS. This page was last edited on February 27, 2019, at 22:51.